Lack of funding is often cited as a cause for low research and education standards in the developing world. Well, Pakistan this notion has now been challenged by Pakistan's experiment in higher education. From 2002-2008, Pakistan's budget for higher education increased 900% (no - this is not a typo) - with 474% just in 2002-2003 alone. It also led to the formation of the Higher Education Commission (HEC). However, now it all seems to have crashed down - and funding has again petered out. So what did we learn from this experiment? 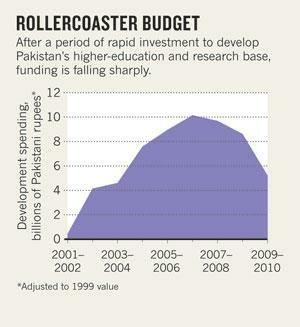 This week's nature has an editorial and an article on the Pakistan's boom and bust cycle. Pervez Hoodbhoy also has an opinion piece for Dawn on the same topic. But critics say that the numbers don't tell the entire story. Pervez Hoodbhoy, a physicist at Quaid-i-Azam University in Islamabad, was initially supportive of Rahman's plans, but grew increasingly sceptical. One day in 2005, he opened his newspaper to discover that his university had bought a particle accelerator. 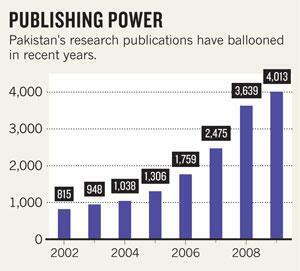 "I rubbed my eyes and said, 'This can't be true'," says Hoodbhoy, who was head of the physics department at the time. The accelerator, an obscure device known as a pelletron, was ordered at the behest of other physicists at the university without a clear idea of how it would be used. "That machine has arrived, it's working perfectly, and for the last year and a half since it's been installed, it hasn't been used," he says. The incident highlights how the flood of cash has led to profligacy, and ultimately to corruption, says Hoodbhoy, who is now one of the most outspoken critics of Rahman's plan. "I began to smell fish, and then it turned out there was a lot of fish." 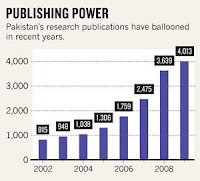 Among other problems, Hoodbhoy says that professors have enrolled PhD students simply for the cash stipends they can claim, that plagiarism has increased and that standards have dropped. There is anecdotal evidence to support his claims. In 2007, the HEC cut off funding to the University of the Punjab in Lahore after administrators refused to take action against faculty members and students who were caught plagiarising. Salal Humair, a public-health scientist at the Lahore University of Management Sciences, a private university, says he has heard of many cases of professors enrolling PhD students for the money. "I think there was a lot of manipulation to try and get HEC funds," says Humair. The money "bred a culture of plagiarism and a culture of, I would say, incompetent PhDs". Even the new tenure-track system, designed to boost funding for the best of Pakistan's academics, has shown signs of corruption. 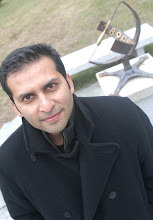 Irfan Chaudhry, an electrical engineer at the University of Engineering & Technology in Lahore, who returned to Pakistan from the United States in 2008 on an HEC grant, says that he saw many professors playing the system. For example, says Chaudhry, a certain number of peer-reviewed publications are required to qualify for the tenure-track system. But many researchers "were publishing in completely random journals that were published in Lahore or somewhere like that. They definitely got around it." So what to make of all this experiment? I think the intentions were good. This program started under Musharraf - despite his other hideous actions, credit goes to him for this - and he picked Ata-ur-Rahman, perhaps, the best choice that he had. But then you run into other realities. In the absence of a general scientific culture, it is unrealistic to change the quality of education and research simply by the injection of more cash. Funding is indeed essential - but it has to come with severe checks and balances. I realize that this is easier to say this in hindsight. Perhaps, the development of few institutes with high quality (both for education and for research) may not have dramatically increase the numbers of publications and PhDs, but it would have provided a foundation for the next generation of researchers. Similarly, there has to be an effort to improve education at all levels - and not just at the universities. There are no short-cuts. India and China are not doing well because they suddenly turned a corner. Instead, a long-term belief in the quality of institutions, like the IITs (Indian Institute of Technology), are now paying off. I don't think it is smart to drastically cut-off the funding for higher education in Pakistan - something that has been done by the current government. The Nature editorial correctly observes that "[i]n a country where only half the population can read, higher education does not have strong support from voters, but politicians must recognize its value. They should look to neighbours such as India and China, which have made large investments in higher education as part of their broader development". It then calls for the World Bank and other donors to step in and help with education funding at a time floods, recession, and internal turmoil in Pakistan. But for any meaningful progress, education institutes must maintain high quality and the government should ensure a long-term commitment. Read the Nature article here, the editorial here, and the opinion piece by Pervez Hoodbhoy here. "Pervez Hoodbhoy, a physicist at Quaid-i-Azam University in Islamabad, was initially supportive of Rahman's plans, but grew increasingly sceptical." Was he denied his "fair share" in the gold rush? This is really sad because opportunities like this do not come often. The moral is to have the prescriptions fleshed out in advance, so that when the funding is forthcoming, it is used effectively.